A great gift for ages 3 and up! This charming 14-inch baby doll has a soft body and brown rooted hair that can be brushed and styled with the included hairbrush. Corolle's Mon Classique Brunette Doll also features brown sleeping eyes and supple vinyl skin that is delicately scented with vanilla -- a Corolle signature. 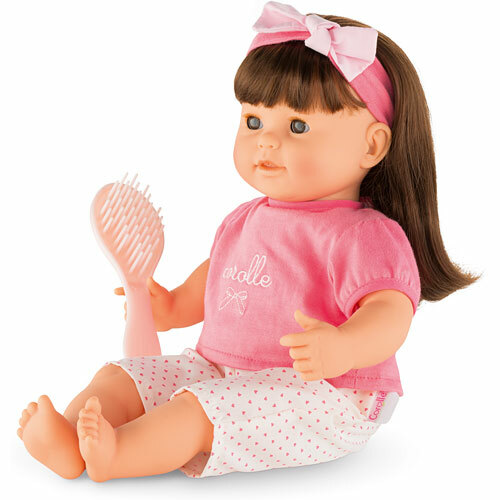 This lovely 14-inch baby doll has long, beautiful brunette hair that can be brushed and styled with the included pink hairbrush. Mon Classique Brunette Baby Doll features a huggably soft, lightweight body that is weighted at the bottom so she can sit up all by herself. Her authentically sculpted face has a sweet expression and lifelike look that will charm and captivate make-believe parents ages 3 years and up. Designed in France, Mon Classique Brunette Baby Doll is part of Corolle's Mon Classique Collection of dolls, fashions and accessories for ages 3 years and up. This adorable doll features high quality materials and careful attention to detail. Her soft, supple vinyl skin is delicately scented with a vanilla -- a Corolle signature, and for enhanced creative play, Mon Baby Classique Brunette's brown eyes close when you put her down for a nap or at bedtime, just like a real baby. Corolle's Mon Baby Classique Brunette is the winner of a Platinum Seal Award from The Oppenheim Toy Portfolio, the only independent consumer review of children's media. The Platinum Seal Award is The Oppenheim Toy Portfolio's highest honor. One 14-inch Corolle Mon Classique Brunette Baby Doll with pink hairbrush. Recommended for ages : 2 to 14+.